Drake’s Bay Oyster Company and its predecessors have operated within Drakes Estero for a century. 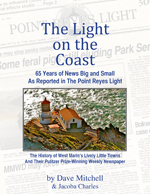 The scientific misconduct of former Point Reyes National Seashore Supt. Don Neubacher (right) — misrepresenting park research to try to force Drakes Bay Oyster Company out of the park — has now become a political problem for the Obama administration. Nebaucher’s misconduct was covered up by Jon Jarvis, then director of the Pacific West Region of the Park Service and now the Park Service director. Especially in this election year, Republicans are looking for ways to take pokes at President Obama, and the White House’s 2009 nomination of Jarvis to be director of the Park Service has provided them with an opportunity. Senator Dianne Feinstein (D-Ca.) had previously excoriated the Park Service’s behavior. Now two conservative senators, David Vitter (R-La.) and Senator James Inhofe (R-Ok.), ranking member of the Senate Committee on Environment and Public Works, have taken up the cause, claiming it epitomizes failings by the White House and its Interior Department. Dr. Corey Goodman of Marshall, an elected member of the National Academy of Sciences, first brought to light the National Seashore administration’s misrepresentations, which have resulted in this political brouhaha. “As we continue to investigate issues related to scientific misconduct at our federal agencies, it has been brought to our attention a concerning matter related to Jon Jarvis, director of the National Park Service (NPS). “Of particular interest to our efforts are the circumstances involving a distinguished member of the National Academy of Sciences (NAS), White House science advisor Dr. John Holdren, and the serious concerns of Senator Dianne Feinstein. “On three occasions in 2009, while the Jarvis (left) nomination was being vetted, Dr. Corey Goodman, an elected NAS member, submitted three letters to you detailing a case of serial scientific misconduct by Jon Jarvis and National Park Service (NPS) officials and scientists under his direct supervision. “It is our understanding that Dr. Goodman contacted you after discussing the matter concerning Jon Jarvis, Drakes Bay Oyster Company, and Point Reyes National Seashore with Dr. (John) Holdren, science advisor to the president. “We are in possession of the three letters dated April 27, 2009, May 10, 2009, and May 16, 2009. That a distinguished member of the NAS would need to send such letters of concern to you directly is distressing. Even more distressing is the fact you that you have failed to respond. “Dr. Goodman’s three letters outline significant matters of scientific integrity that in the light of President Obama’s promise of ‘restoring science to its rightful place’ logically would have necessitated your response and responsible steps to rectify Jarvis’ work. “At a minimum, all of these should have been disclosed during Jarvis’ nomination process to the White House, Senate Energy Committee and the Congress, and all should have been made aware of the ongoing investigations into the the work of then-Regional Director of the Pacific West Region Jarvis. “We are also aware that you asked Mr. Jarvis to respond to Dr. Goodman’s 21 points outlined in his May 16, 2009, letter to you, but that Mr. Jarvis responded to only seven of those points on May 17, 2009. “At Dr. Holdren’s request, Dr. Goodman (who plays jazz in his spare time, left) provided a critical review of Jarvis’ partial response on May 19, 2009. “Did Congress have copies of Dr. Goodman’s three letters, the Jon Jarvis response, and Dr. Goodman’s critique of that response during the nomination process? If not, why was this information withheld? “Our question, of course, then would be: If the NAS, the Interior IG, and DOI [Department of the Interior] Solicitor properly disclosed the totality and scope of pending scientific integrity issues, and then fully disclosed his conduct to the White House and the President, would (a) Mr. Jarvis’ name even have been recommended by you to the President; and (b) the President have submitted the nomination to the US Senate for confirmation? “Over the last several years we have uncovered multiple instances of scientific misconduct at the EPA and Interior. Last year, we noted some of those in a letter to Dr. Holdren. Unfortunately, Dr. Holdren flouted congressional oversight and implicitly admitted in his response that he had not taken any steps to address these very real and serious concerns. “1. What is the status of Interior’s response to the three letters by Dr. Goodman’s critique of Jarvis’ partial response? “2. Who at Interior was charged with responding to the three letters written by Dr. Goodman? Please provide all emails, memorandum or other documents related to each of Dr. Goodman’s three letters. “3. Upon receipt of Dr. Goodman’s complaint, did you as Secretary direct that an investigation be initiated to determine whether or not the Data Quality Act, White House STP [Science and Technology Policy] on Research Misconduct, or the NPS Code of Scientific and Scholarly Misconduct were violated? If not, why not? “4. Did you disclose to the White House, when the Jarvis nomination was being vetted, that three letters and 21 counts of scientific misconduct against Jarvis were pending? Did you or anyone else at the Department of the Interior similarly disclose these developments to the US Senate? “Please provide the report(s), letters, memorandum, emails and/or documents which disclosed these circumstances to either the White House and/or the US Senate during consideration of the nomination or during the confirmation process. If any information was withheld, who at Interior or the White House determined that the information related to Mr. Jarvis’ conduct did not need to be brought to the the attention of the Senate during his confirmation? Kevin Lunny, owner of Drakes Bay Oyster Company. “5. What is the status of the permits for Drakes Bay Oyster Company? “6. Did Mr. Jarvis disclose that in December 2007, a 77-page integrity complaint had been submitted to the Director, National Park Service and never answered? “What is the status of the outstanding ethics complaint against Jon Jarvis and Don Neubacher submitted to [former NPS] Director [Mary A.] Bomar on Dec 18, 2007, and did the US Department of the Interior and/or the National Park Service investigate those scientific misconduct allegations? “7. The third of three Goodman letters detailed 21 counts of scientific misconduct by Mr. Jarvis. Immediately upon receipt, according to available information, Mr. Jarvis provided you with responses to seven of the 21 counts and did not even address the majority of the charges. Please provide detailed responses to each of these specific charges. “Why was Mr. Jarvis allowed to provide only a partial response? Why did you fail to respond to Dr. Goodman? Were Jarvis’ responses provided to the White House and/or Senate Committee on Energy and Natural Resources? “Please attest to the veracity of each of the 21 points outlined in the May 16, 2009, letter from Dr. Goodman. Which of the points did Jon Jarvis respond to and which did he exclude? In light of Dr. Goodman’s critique of Jarvis’ partial response, do you consider the Jarvis response adequate? “We concur with Senator Feinstein that ‘the transparency that comes with scientific review is a good thing, even when it doesn’t support an individual’s agenda.’ It remains imperative that individual agendas of federal bureaucrats lacking a scientific basis are not allowed to undermine private citizens and our economy. “If nobody has yet been charged with responding to Dr. Goodman’s letters, we ask that you personally respond and that we receive copies of those responses. It is particularly troubling that Jarvis was accused of being involved in and directing a cover-up of the fabrication, falsification and/or misrepresentations of scientific misconduct. “It is further frustrating that you were informed of these significant matters and it appears that nothing was done. Senator Vitter (right): “We’ve seen facts manipulated and science ignored across the administration while they’ve developed policies with huge negative effects on the economy. “We want the public to be aware of the administration’s scientific gimmickry, because important policy decisions by the EPA and Interior shouldn’t be based on guesswork or manipulated facts. Senator Inhofe (left): “It is extremely troubling that 21 counts of scientific misconduct by Mr. Jarvis were either ignored or only partially addressed by Secretary Salazar, especially as Mr. Jarvis was being considered for a key post within the Department of the Interior. Both Vitter and Inhofe are friendly to the Tea Party and skeptical of scientists who say humans are contributing to climate change. By misrepresenting scientific research, Jarvis and Neubacher ended up playing right into the senators’ hands. I just see this as playing right into the Republican cause – to support corporations and big business – to squelch the environmentalist and to waste tax payers dollars attempting to deal with the issue that was finalized years ago. What a monumental coop! “Liberal” left wingers meet up with the worst of the worst right wingers. Keep the flames going on an old issue that will distract from the real proposition – Wilderness or not? A side issue of years of planning down the tube or not? An issue of the Lunny’s knew what they were getting themselves into and now they call themselves the victim. I would have to laugh, but it is a true tragedy. In defense of the Lunnys, it might be noted that when they bought the oyster farm from the Johnson family, they knew the permit for the onshore facilities would expire in 2012. However, as with a lease, an expiration doesn’t usually mean the tenant will then be evicted and not offered a new lease. And what reason did the Lunnys have for believing the permit would be renewed? When the Johnsons still owned the company, Don Neubacher, then the National Seashore superintendent, wanted the onshore facilities fixed up, so he applied for a county building permit. In the application he said the oyster company would most likely continue in perpetuity and noted that oysters are vital to Californians. Sparsely Sage and Timely is powered by	WordPress 4.9.10 and delivered to you in 0.588 seconds using 56 queries.